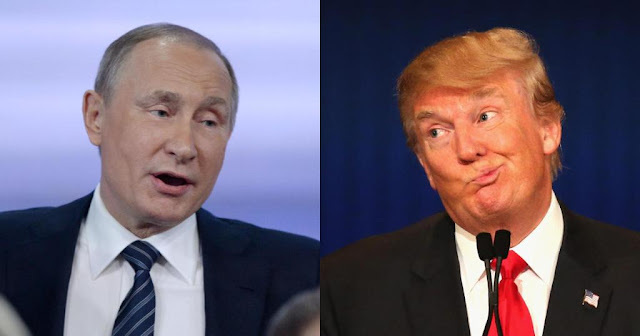 WataugaWatch: Trump & Putin in Hamburg: "A Lot of Very Positive Happenings for Russia"
Trump & Putin in Hamburg: "A Lot of Very Positive Happenings for Russia"
DJT: Some people say you meddled in our election. Putin: We didn't meddle in your election. DJT: Oh, okay. That's what I thought too. Now, what can I do for you? "Mr. Putin, in the end, appears to have settled on a long game, convinced that his mix of information warfare, 'active measures' and low-level aggression will ultimately get him what he wants, a restoration of Russia’s status" (Davis, Sanger, and Thrush). “We look forward to a lot of very positive happenings for Russia, and for the United States, and for everybody concerned. And it’s an honor to be with you,” Trump told Putin while cameras were still in the room.